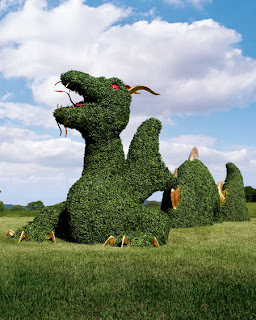 Finally, someone has recognized it's importance, the class a stylish Topiary can bring to a lawn. Although Cow is somewhat dubious that Topiary can be created so quickly on a lawn (most take years to grow) she is behind this gift idea all the way. Surely $35,000 and up is reasonable for one's own dragon? Just take that out of the gasoline budget for the year, cut back on a few non-essential trips.